In pursuit of continuous improvement and technological leadership, Survival Systems Limited has developed the METS® Model 12000 SmartJib™. The system provides the client with the highest level of safety and user friendly options that is available for aircraft ditching training today. The SmartJib™ monitoring and control functions offer the client accurate, repeatable, and documented training routines, as well as the ability to control and sequence other training devices such as wind, waves, fog, lighting and sound for a complete and state of the art environmental simulation training system. 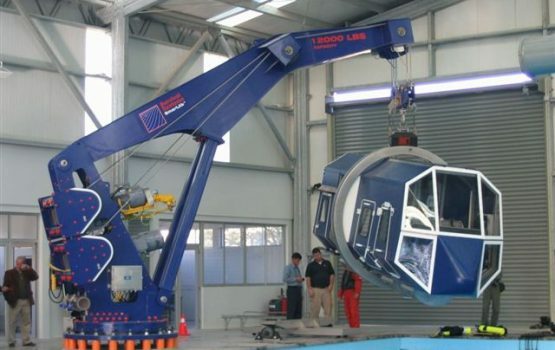 The system is currently under review by DNV (Det Norske Veritas) as a worldwide certified personnel handling system for aircraft ditching training. The METS® Model 12000 SmartJib™ is a freestanding handling system and features dual lifting mechanisms, integrated METS® remote air brake system, user settable variable ditching speeds, advanced ditching monitoring, effects sequencing and control as well as a Redundant Retract System (RRS) to eliminate the dependence of electrical power in critical training periods. SmartJib™ Model 12000 can be customized to suit your needs. Please see the options below. If you have any questions, please contact us. Independent motors (2), gear boxes (2), drums (4), cables (4). Each cable is capable of independently holding the load through an innovative leveling plate system. Additional Safety Features include: Independent motor brakes (2) – Redundant Air Powered Emergency Retract System (1) – Integrated Electrical Ground Fault Personnel Protection (1) – Radio Remotes (2) and Pendant Crane Control (1) – User Friendly Operator Interface and On-Screen Guide (1) – Operator Training – Installed at Customer’s Site.